Madame de Plume - aka Audrey Raymond - creates in a unique and delightful artform by the use of silhouettes, fashion plates and other images from the 18th to 21st Century which are then adorned with feathers, butterfly and beetle wings, snakeskin, animal hair, flowers and other treasures from an Australian garden, a farmyard or the wayside, to create Images de Plumes - pictures of great beauty and originality. There is an immense variety of subject matter depicting varying moods, from humour to romance, sophistication and much more. From simple beginnings, Audrey has developed her feather art to a highly sophisticated and intricate level, and is continually experimenting to expand and vitalise her art form. Her work has been hung and sold in art exhibitions and galleries in Sydney, Brisbane, and the Sunshine Coast. 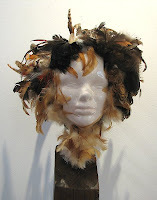 I have several delightful examples of her work in the gallery - and have just taken delivery of this wonderful 3D feathered head.